High school student Chloe seems to have everything together. She is a soccer player, a dancer, and a top student. But under the surface, the pressure is mounting. When her mom and brother need help at home, the school projects pile up, her friends pressure her to start dating, and her attention is pulled in several directions, she doesn’t want to disappoint anybody. In her effort to please everyone, her world begins spinning out of control. As the various friends, family and other responsibilities build up around her on the stage, she creates and deploys multiple versions of herself – the Chorus – in an effort to be “everything to everybody,” with hilarious, and unsuccessful, results. Sometimes, we all wish there were “more of me,” but Chloe’s real embodiment of this idea reveals that there are still not enough hours in the day, and the situation poses a very real threat to her mental and physical well-being, as the end of the first act makes all too clear. What the constantly-spinning Chloe desperately needs … is some spin control. 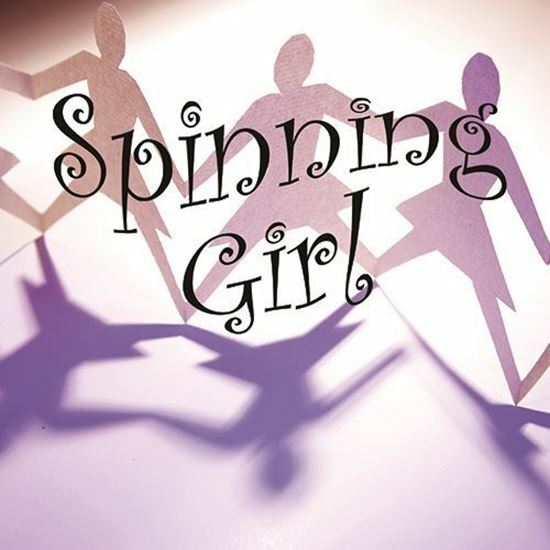 Spinning Girl resonates with both teens and adults, and created a positive, powerful and heartfelt reaction in both the cast and the audience. The play offers flexible casting, a range of lead and supporting roles, and it can be performed with minimal set requirements on the tightest of budgets. The show has pace and energy, but also powerful moments between actors, and proved to be both poignant and genuinely funny. And, as Chloe realizes in her epiphany in Act II, it’s not just teen girls who spin. In a world in which – as it was brilliantly pointed out to me recently by a good friend – we are not allowed to be ordinary in anything, people of all ages strive to be excellent at work, amazing cooks, outstanding parents and awesome in their social media. It was very rewarding to hear the adults in the audience laughing at the omnipresent coffee cups and desperate, polite conversation. This play was always intended to resonate with a wider audience than just teenagers. What is your favorite part in the play? In terms of the stage effect, I really enjoyed writing the Chorus. I have always been fascinated by what theatre can do that film and television cannot, and the vocal and physical impact of the Chorus was fun to write and invigorating to direct. In terms of the script work, I am very happy with the final scene between Chloe and Liam. We all need a Liam in our lives – calm, gentle and funny – and the repartee between the two of them really comes off well, I think. At the initial read through of this play, I was both taken aback and humorously surprised by the avalanche of responses to just this question. It seems all the students involved were convinced they knew each of these young characters, and not a few of their adult counterparts as well. In truth, though I hope the parts are as recognizable to you as they were to the cast, they are of course amalgams of the students and their family members I have encountered over the years. What did you to try to achieve with this play? In my writing for young actors, I seem drawn to creating stories which offer a sense of recognition in both the cast and the audience. I did not want to write solely about the very real and serious issues of anorexia or bulimia, only about a girl who convinces herself that she does not have time to eat. I did not want to write a didactic play which directs the audience towards a clear answer to the problems of over-commitment and over-achievement, only to explore the issues, and suggest that finding a place of calm and kindness makes individual solutions possible. Above all, I wanted to write a play which would resonate and reverberate with people even after the curtain falls. Often when we write and direct theatre, we can hope for these things, though we can’t really be sure that they actually occur. In the case of Spinning Girl, I can honestly say that the play really did seem to meet, and exceed, all I hoped for. At the initial read-through, the cast were in tears at the end of the first act, and we talked for half an hour before they were ready to continue, and then overran our rehearsal time as they shared their own experiences and reactions afterward. After the performances, I was humbled by the flood of responses which came in. Both students and the adults in their lives felt sufficiently moved to tell me how much of the play had hit home. Perhaps the most gratifying were the multiple instances where I was told by either the teen or their parent that a conversation about the “spinning” in each of their own lives was precipitated by seeing the play, and that this topic had found a voice that had not been there beforehand.